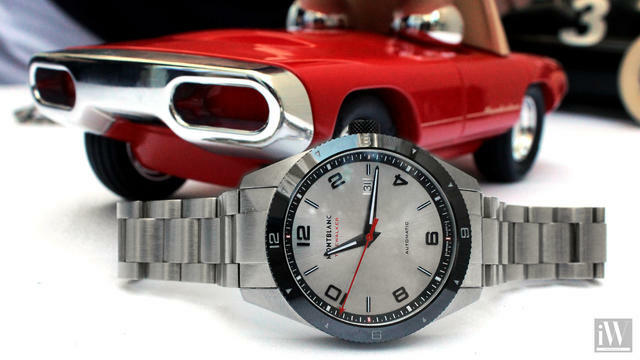 This 50mm titanium wristwatch can be converted into a pocket watch or it can be used as a table clock. But its primary purpose harkens to its role as a dashboard timer inspired by those Minerva manufactured in the 1930s. 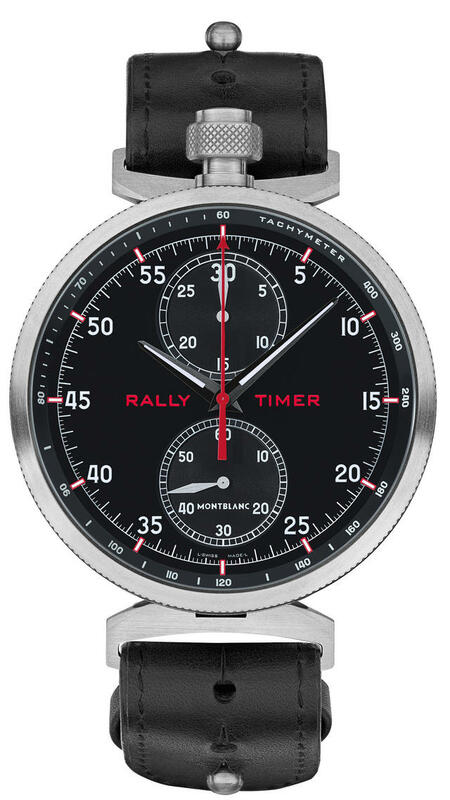 The chronograph’s 30-minute counter at 12 o’clock is vertically aligned with the small seconds subdial at 6 o’clock, reminiscent of the original Minerva Rally Timer. In the center, the red chronograph second hand runs along a tachymeter scale, which can be used to calculate speeds over fixed distances. The open caseback in the shape of a car grill that reveals the beauty of the Manufacture manually wound monopusher chronograph Caliber MB M16.29 inspired from the original Minerva caliber 17.29 developed in the 1930s. This modern version also features hand-crafted Côtes de Genève stripes, inner angles, circular graining and beveling, Minerva arrow, a chronograph bridge shaped in the form of a “V” (a shape that was patented in 1912), and a large screwed low-beat (18,000 bph) balance. 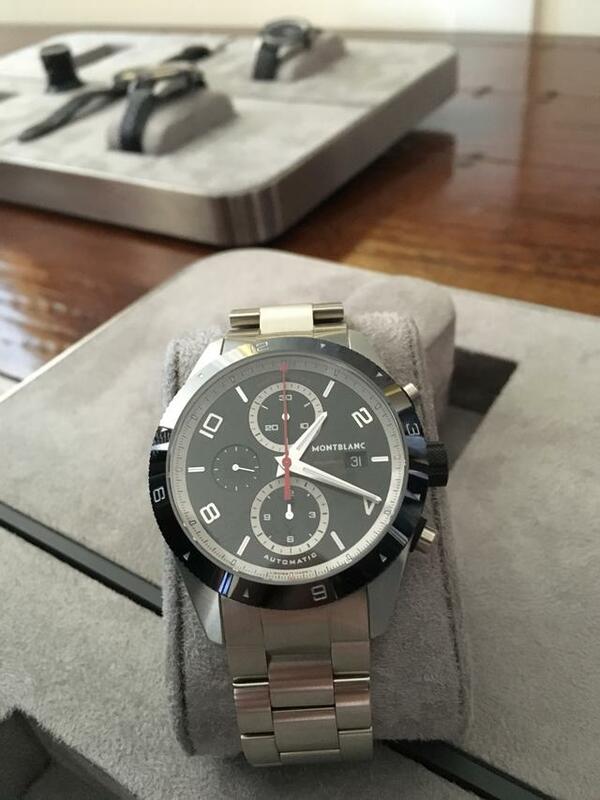 These two chronographs are sporty 43mm steel models with easy-to-read dials, subdials and hands. The TimeWalker Chronograph UTC offers a date display alongside central hour and minute hands, small seconds at 9 o’clock, second time zone-hand from the center with a 24-hour scale on the unidirectional rotating bezel and a third time zone indication via the black ceramic bezel. 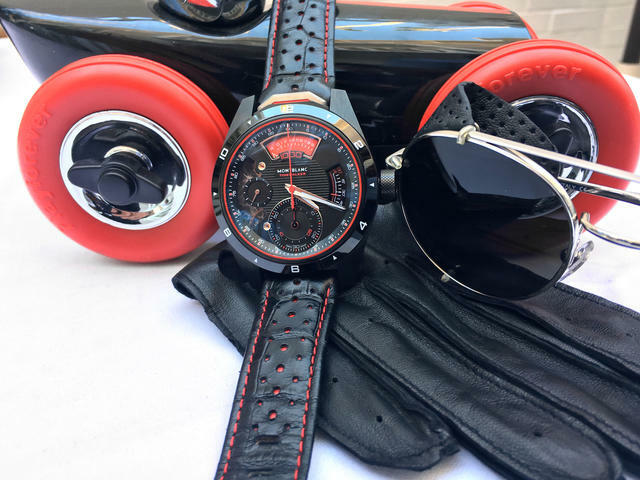 The black dial features contrasts with silver and red elements and three-dimensional counters that resemble vintage car dashboards. The chronograph seconds are indicated via the iconic red central hand with the tip shaped in the form of the Minerva arrow. The second time zone is set via the crown, allowing a quick adjustment of the time in hourly increments without affecting the functioning of the minutes. The date is synchronized with the local time. A third time zone can be indicated by turning the unidirectional rotating bezel to the new time zone and referring to the location of the 24-hour hand. The TimeWalker Chronograph Automatic includes many of the features of the UTC model, but without the third-timezone hand. In addition, this dial is black with silver chapter rings and a bezel marked at 12, 3, 6 and 9 only. Both chronographs come with a choice of three different strap options: perforated leather, perforated rubber, and a new performance metal bracelet with three links. This simpler TimeWalker dial design is set into a 41mm steel case, slightly smaller than the two new TimeWalker chronographs. It retains the same new TimeWalker unidirectional rotating black bezel made of high-tech black ceramic (for tracking a second time zone if desired), a date and highly legible Arabic numerals. And like the others in the new collection, the seconds hand here has also been highlighted with the tip of the Minerva arrow. The primary dial distinction here is the use of stopwatch minute markers, meant to recall early Minerva stopwatch dials. This new model works with two different balance mechanisms. One displays the ongoing time and the other is dedicated to tracking a timed event. The hours and minutes are displayed via a traditional large balance set to 18,000 bph, but the chronograph is powered separately by a second small balance (seen at 10 o’clock) that oscillates at an incredible 360,000 bph (50 Hz). What’s more, Montblanc has also added a finer adjustment by equipping the chronograph’s small balance wheel with two hairsprings fixed on top of each other. The chronograph function is powered by its own barrel, which stores enough energy to measure intervals of up to 45 minutes in duration. 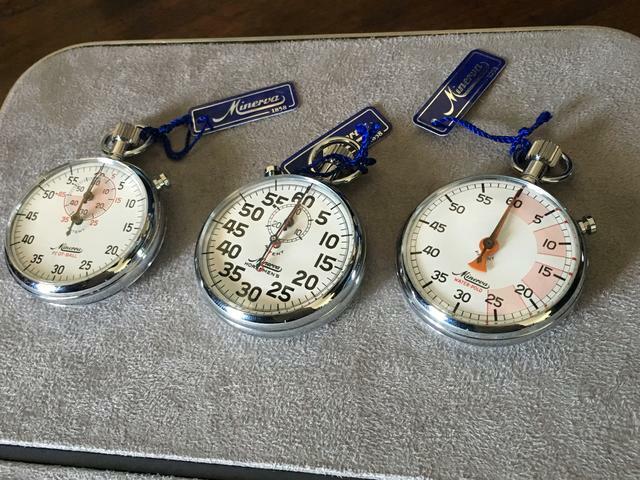 But if a user prefers to extend this duration he or she can turn the crown counter-clockwise even if the chronograph is running to add fresh energy to the chronograph’s barrel. The going train for the ordinary time display draws its energy from a second barrel that guarantees a 100-hours of power reserve. This dual-balance technology, which Montblanc first demonstrated three years ago in its TimeWalker Chronograph 100, is this year (with Montblanc Manufacture Calibre MB M66.26) displayed in a distinctive racing-inspired dial. 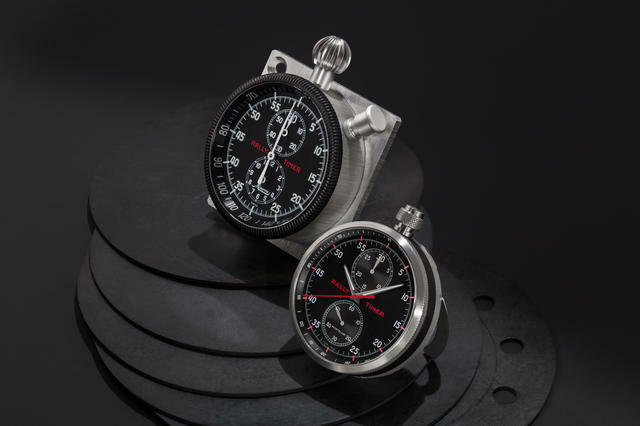 The chronograph power reserve indicator on the right of the dial is inspired by old fuel gauges, while the black and red details and the 1/1000th of a second indication are reminiscent of early auto racing dashboards. Knurled crowns and bezels evoke vintage gas tank caps, and red holes in the black alligator strap are typical of driving gloves. In fact, the chronograph monopusher at 12 o’clock closely mirrors early Minerva stopwatches. 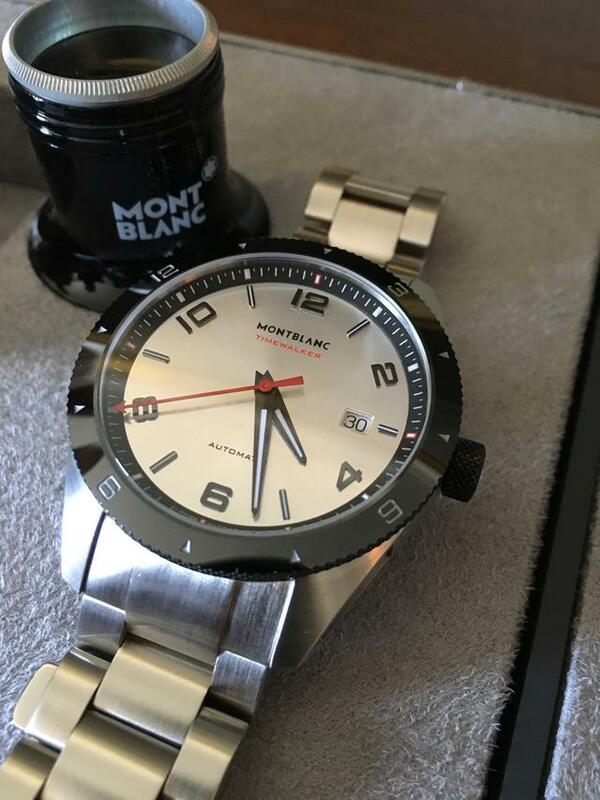 The 46.4mm case here is made of titanium and features a ceramic black bezel. Only eighteen will be made.